This exciting coloring book introduces you to 46 of the world's most unusual animals — from the wandering albatross, with a wingspread of up to 11 feet, to the net-nabber spider, which drops a silken web on its prey. Realistically rendered by nature artist Ruth Soffer are the cheetah, the fastest land animal over short distance; the shock-producing electric eel; the amazing aye-aye, a nocturnal creature with a long, skeletal middle finger; the horned lizard, which squirts blood from the edges of its eyelids; and the Portuguese man-of-war, a variety of jellyfish with long, stinging tentacles. Also included are the giraffe, whale shark, glasswing butterfly, Tokay gecko, and many other animals considered especially unusual because of their shape, coloration, defenses, and adaptation for survival. Captions provide fascinating information about each animal. 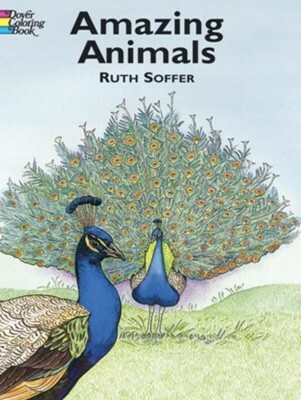 In addition to illustrating books for Dover, Ruth Soffer has also done work for other major publishing houses. An artist specializing in natural science subjects, she lives in Brooklyn, New York. I'm the author/artist and I want to review Amazing Animals Coloring Book.